The Mars 2020 mission will gather samples from Martian rocks and soil using its drill. The rover will then store the sample cores in tubes on the Martian surface. This entire process is called "sample caching". Mars 2020 will be the first mission to demonstrate this on Mars. It could potentially pave the way for future missions that could collect the samples and return them to Earth for intensive laboratory analysis. MAIN FUNCTION: Collect and store a compelling set of rock and soil samples that could be returned to earth in the future. A big job for the rover is collecting carefully selected samples of Mars rock and soil. These samples will be sealed in tubes and left in a well-identified place, or more than one spot, on the surface of Mars. Detailed maps will be provided for any future mission that might go to Mars and pick up these samples for study by scientists. The belly of the rover houses all the equipment and supplies needed to collect samples. It contains a rotating drill carousel, which is a wheel that contains different kinds of drill bits. Next to that are the 42 sample tubes waiting to be filled. 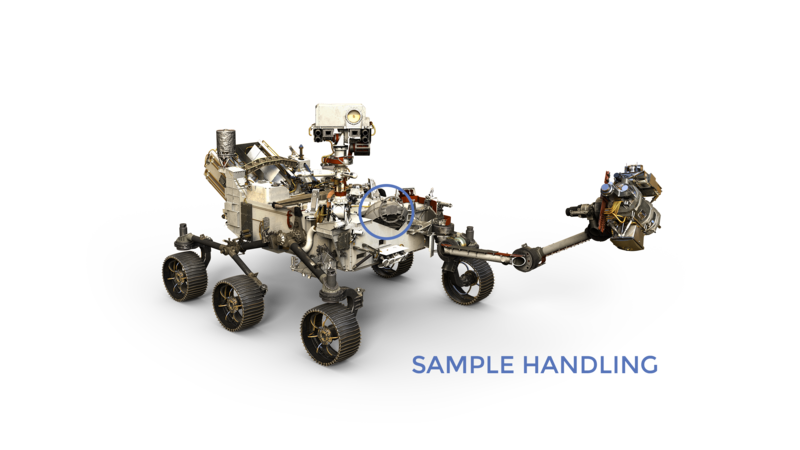 While the rover’s big arm reaches out and drills rock, the rover belly is home to a small robotic arm that works as a "lab assistant" to the big arm. The small arm picks up and moves new sample tubes to the drill, and transferred filled sample containers into a space where they are sealed and stored. The Mars 2020 rover must meet the extraordinary cleanliness measures called for by NASA's Office of Planetary Protection. These measures are in place to avoid contaminating Martian samples with terrestrial contaminants that may inadvertently be brought from Earth. Strict rules limit the amount of inorganic, organic and biological materials from Earth in the rover and its sample handling system. any other Earthly organic or inorganic material that may have arrived on Mars with the rover. One at a time, the witness tubes will be opened on the Martian surface to "witness" the ambient environment near sample collection sites. They are exposed to the local environment where samples are collected and they go through the motions of drilling and other movements that the sample containers experience. The witness tubes do not, however, collect soil or rock samples. The witness tubes will also be sealed and cached like the actual Mars samples. In the future, if the Mars 2020 samples are returned to Earth for analysis, the witness tubes will show whether Earth contaminants were present during sample collection. This will help scientists tell which materials in the Martian materials may actually be of Earth origin. After a sample is collected, the sample tube is transferred back to the rover's belly. There, it is handed off to the small interior robotic arm and moved to inspection and sealing stations. Once the tube is hermetically sealed, nothing can enter or leave it. The tubes are stored in the rover belly until the team decides on the time and place to drop the samples off on the surface. At a time and place of the team's choosing, the samples are deposited on the surface of Mars at spot that the team designates as a "sample cache depot." The depot location or locations must be well-documented by both local landmarks and precise coordinates from orbital measurements. The cache of Mars samples remains at the depot, available for pickup and potential return to Earth.